I didn't have the opportunity to cook all week so when we got back from a nice early dinner at a new restaurant in the FiDi called Wexler's last night (more on that later), I was suddenly possessed by the urge to make something new...The idea was to experiment with a new recipe without actually having to cook the same day. I knew exactly what I was itching to try - **overnight** bread! Now that I have accumulated a vast library of cooking books thanks to Lukuma and Crisco, I only needed a minute to locate the right recipe. Ciabatta!!! In order to impart the characteristic Ciabatta flavor to the dough, an overnight biga (or sponge) is required. I woke up around 9 am this morning and checked on the biga. 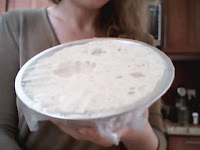 Things were going pretty well - the yeast had done its job and the mixture had doubled or tripled in size, its smooth consistency turning into a bubbly pillowy mess. Combine flour, yeast, and water in medium bowl and stir with wooden spoon until uniform mass forms, about 1 minute. Cover bowl tightly with plastic wrap and let stand at room temperature (about 70 degrees) overnight (at least 8 hours and up to 24 hours). Very yummy! What are the proportions of flour/water/yeast?